First parliamentary and Assembly of Experts votes since nuclear deal are to act as referendum on the deal, and possibly on next Ayatollah. 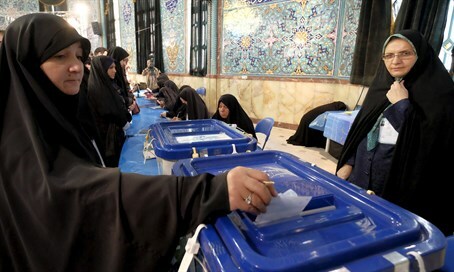 Fateful elections are taking place in Iran on Friday, as nearly 55 million citizens out of a total of 81 million select new members of parliament as well as clerics for the Assembly of Experts. The vote, which began at 8 a.m. local time and is to continue till 6 p.m. unless it is extended due to heavy turnout, is seen as a referendum on the nuclear deal pressed by President Hassan Rouhani. In the election his allies will try to gain control of the Majlis parliament from "hardliners" who opposed the deal, with results likely to effect Rouhani's shot at re-election in 2017. Aside from the 290 MPs being picked for four-year terms, 88 clerics will be chosen by the public for the Assembly of Experts, where members serve eight-year terms and can choose or dismiss the supreme leader. Given that Iraniain Supreme Leader Ayatollah Ali Khamenei is 76-years-old and has been in failing health, it is likely this election will influence the choice of Iran's next supreme leader. After voting on Friday, Khamenei was quoted by Fars News Agency as saying, "we have enemies who are witnessing elections with their greedy eyes and our choice (of candidates) should disappoint the enemy." Top candidates in the elections are Rouhani and former president Hashemi Rafsanjani. Hassan Khomeini, a grandson of the first Supreme Leader Ayatollah Ruhollah Khomeini who is said to be a reformist, was disqualified by the Guardian Council that serves under Khamenei, along with around half of the 12,000 candidates. Of the 6,229 candidates allowed to run were 586 women, comprising 9.4% of the total. Candidates only had one week from last Thursday to this Wednesday to campaign, meaning established candidates enjoy a keen advantage. There are around 250 registered parties. Despite the veneer of democracy, all candidates must first be vetted by the Supreme Leader, meaning only staunch loyalists are able to run at all.